Polson Pirate Jarod Farrier battles his way to a win. Pirate Jasper Drake wraps up Ronan Chief Persephone Sandoval. POLSON – The rivalry between the Polson and Ronan high schools is nothing new. No matter the sport, you can find a spirited atmosphere with these two schools. 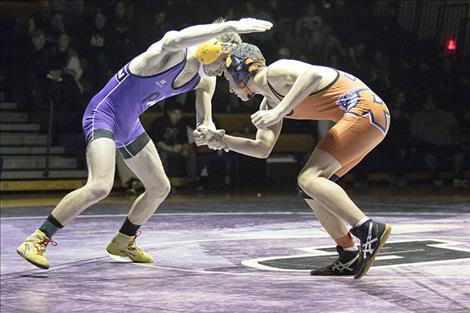 An excellent example of this was Thursday evening’s wrestling dual between the Pirates and the Chiefs at the Polson High School gym. The gym lights were dimmed low to put a focus on the wrestlers battling it out on the mats while fans from both schools were boisterous and energetic as several individual matches came down to quick pins and third period decisions. The match ended with the Pirates defeating the Chiefs 60-15. 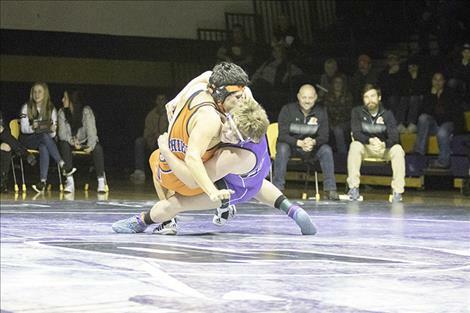 The Pirates recorded 10 victories on Thursday with five of them winning by pin, including Jarod Farrier (132), Bridger Wenzel (152), Hunter Fritsch (170), Logan Adler (182) and Jasper Drake (285). Receiving forfeit wins were Rene Pierre (113), Kellen Norman (120), Dugan Davis (138), Caleb Pierre (145) and Garrett Croft (160). Winning for Ronan by pin was Justin Mays (205) and Trevor Bartel (103). Trapper McAllister (126) won by a 9-4 decision. Both squads will be back on the mats on Friday and Saturday during the Western A Divisional Tournament in Butte.